Visitors need to know at a glance what you do. There are potentially hundreds of other companies around you trying to attract the same people. Ensure your product is the most obvious feature, and keep your message clear and simple. Don't overfill your stand. As a rule, half of your floor space should be free for visitors. 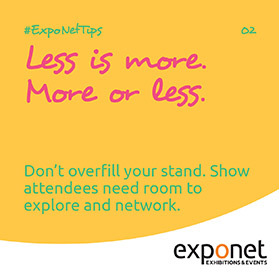 Otherwise, if it is hard for visitors to even step onto your stand, how are they supposed to easily network with you in a comfortable environment? 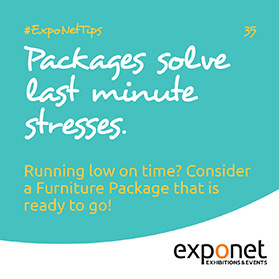 Prepare yourself with handy giveaways, such as flyers, cards or even fun branded objects like stress-balls, or even food! Everyone loves food. Or perhaps you have an amazing demonstration prepared that will leave a lasting impression? 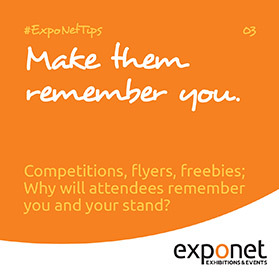 Always work towards being a memorable exhibitor for event attendees. 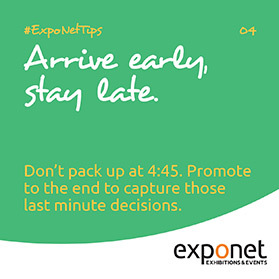 The last hour of the day is often the 'golden hour' with many attendees rushing about trying to make their final decisions before a show closes. 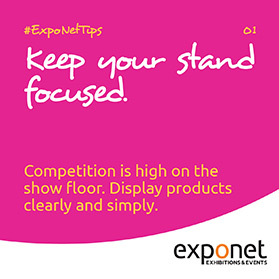 Capitalise on this by staying on your stand for as long as possible. Don't start packing up at 4:45pm and closing for the day, keep promoting right until the end. 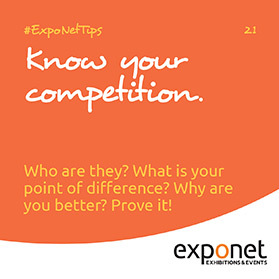 You may even find your competitors have disappeared for the day and your are all that is left! If you are working with many products and lots of information, consider breaking your stand up into distinct learning or category zones. 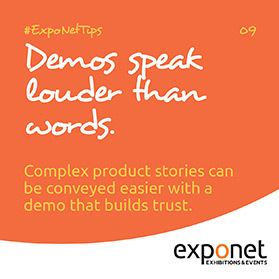 Have attendees see similar products all within one area, and then be able to move elsewhere to discover a new product line. This method can make large spaces seem less overwhelming and help attendees remember what they learn. Tweet like everyone is following. There is a lot of conversation happening online. Push your way into the conversation by using Twitter and Instagram as a social medium for sharing what is happening on your stand in real-time. 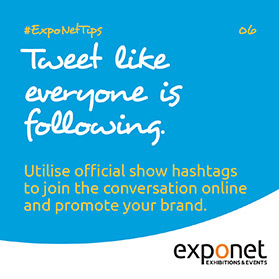 Find relevant Hashtags and use them within your own posts so your product can be seen and shared. 7. Tell the world what you do. Don't just build yourself a pretty looking exhibition stand. Be sure to convey what your company actually does! 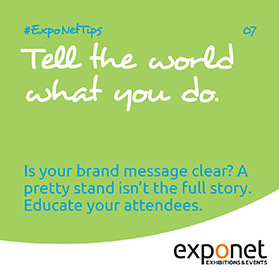 You must tell the world what you do... and the best way to do that is with effective signage and branding. 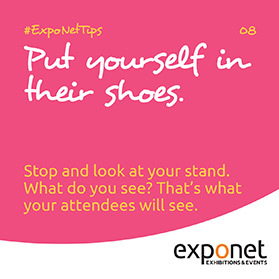 It is the only way for attendees to understand your exhibit and judge whether they should talk to you. Pretend you are your customer. Step off your stand and into the aisle, turn around and look at your stand. What do you see? Can you see your company name clearly? Can you find products easily? Can you read your signage comfortably? This is the experience of your customer. Make it a good one. Selling a product that takes a bit of explaining? Why not run a live demonstration right there on the stand! Only then can potential customers really see it operating successfully, plus they may think of questions that wouldn't otherwise be answered by posters and diagrams full of words. 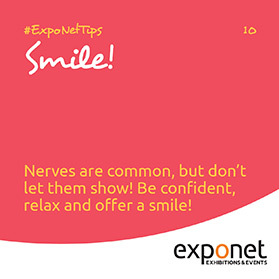 It is common to feel nervous when the show opens and new people start approaching your stand, but don't let those nerves show themselves. Frowns, concerned eyebrows, busily rushing about - these are all negative body actions that can turn away potential customers. Take your time and make a note to smile each time somebody walks by your booth. 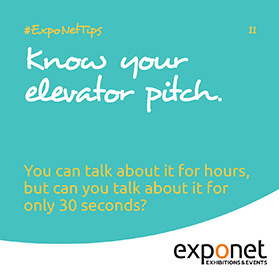 You hopefully know every one of your products very well - and could probably talk for hours about every tiny detail. But can you explain it in 30 seconds? What is the one sentence that best describes its function and result? Sometimes that is all the time you have! 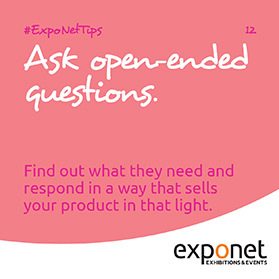 Open-ended questions are the best way to deliver personalised and specific information to visitors. Instead of assuming you know what your product can do for them, find out what they actually need and then respond in a way that sells your product in that light. Budgets are critical. 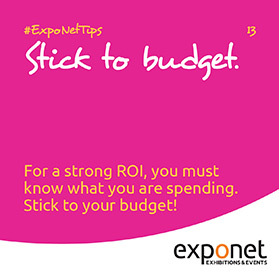 Without one, you can spend far more than you could hope to receive in return from an event. 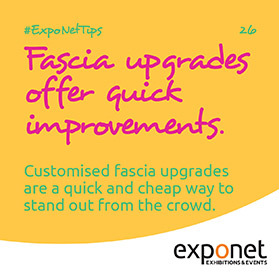 If you are unsure what you could get for your money, speak to an event supplier and ask for some examples, or explain what you require and have a supplier quote the project. Budgets can go awry in many ways. Be sure to account for all situations - and then stick to it! 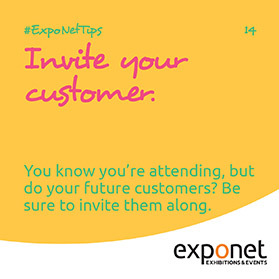 Be sure to send out letters to your relevant contact database with the show details, your stand location and don't forget to tell them what they'll receive for stopping by! Because there is a reason, right? Why not buy tickets for your top 10 customers and give them away in a competition online via Social Media as additional promotion. 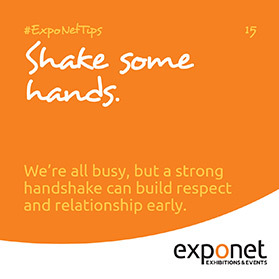 We are all busy people, and our time is precious, but that shouldn't stop you making the effort to physically connect with attendees by simply offering a handshake. 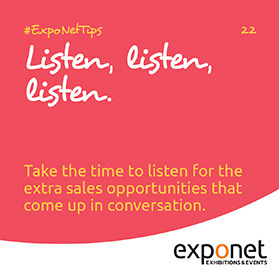 This small act can start a conversation, hold an attendee within your stand for a few moments longer, or simply add respect and courtesy to the interaction. Don't forget to make it a strong handshake too! 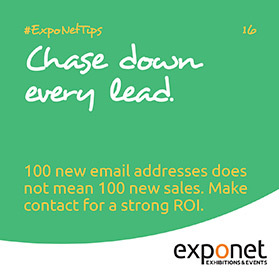 Just because you networked well and collected 100 new emails doesn't mean you have 100 new customers. Chase your leads! Follow up and personally make contact with each new prospect, deliver on any promised activity, and then track the results for a clear ROI. More staff does not equal good staff. Buyers are looking for quality. 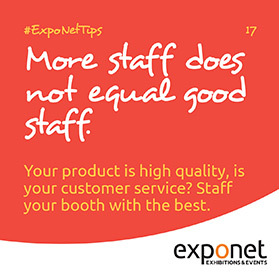 Quality staff will serve, explain and capture information to and from clients in a brand-positive way. Having too many staff on your stand can not only seem squashed, but can potentially highlight a lack of interest with those standing around. Let designers do the designing. Provide a clear brief to your chosen design team that covers all areas of your stand such as: budget, sales goals, graphic needs, meeting space needs, catering, demographics etc. The more information you can provide, the better the solution your design team can develop. They have the experience, and can design highly creative solutions for seemingly mundane needs. Don't run out of materials. 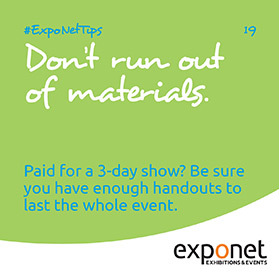 If you've paid for a 3-day show - make sure you have enough promotional material for 3 days! The last thing you want is to run out of handouts mid-way through the second day and then lose all of those potential buyers simply because they won't remember you. Stay away from excess. 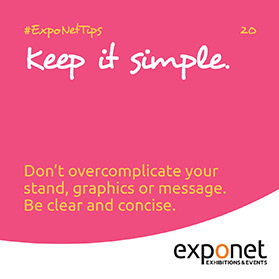 Don't fill every square metre of your stand with furniture, don't cover your graphics in big blocks of text, don't stand there and do all the talking. Keep your message simple. Who are your competition? Are they exhibiting at the same show as you? Do you know what their regular sales or discount technique are? Do you know their products? How are yours any different/better? Potential customers will be shopping for the best value for money, and may ask you why they should choose your product over the competition. You've rehearsed your sales pitches over and over, you know every product detail and you're ready to sell, but wait... what is the customer actually asking? Did they just ask about colour options and you replied with size options? That isn't going to work well. Be sure to stop talking and allow them to ask questions... and listen! Look like you want to be there. 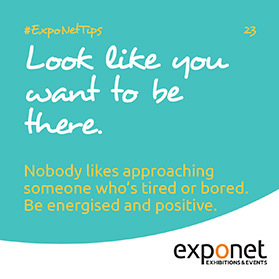 Nobody likes approaching someone who seems tired, annoyed, bored or busy. An exhibition is a fantastic opportunity for you as a marketer - you should want to be there, so look like you want to be! Be energised, positive and smile. It can be hard work some days, but worth the reward. The correct stand design is critical. It should be on-brand, efficient, deliver the required message, display your product, attract attention and promote your business... all at the same time! 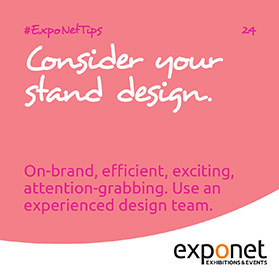 Use professional and experienced staff (like our ExpoNet design team!) to design a customised stand that maximises your impact, or select from some of our cost effective stand packages. 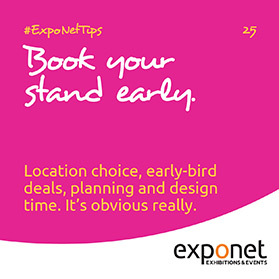 Once you know you want to exhibit, book your stand space early! You will have a choice of stands, time for planning and may be eligible for an early booking discount. 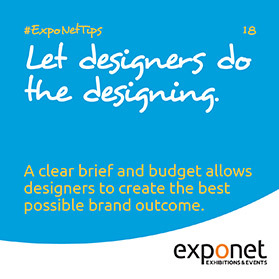 In addition to the obvious benefits, you'll also have more time to establish budgets, designs and product. Customised fascia upgrades are a quick and cheap way to stand out from the crowd. 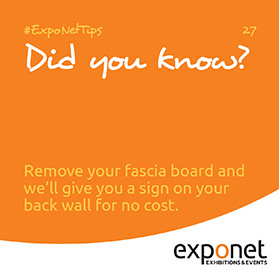 Remove your fascia board and we'll give you a sign on your back wall for no cost! Light sells. The brighter your booth, the more you stand out! How much are you plugging in? More than one item to plug in? 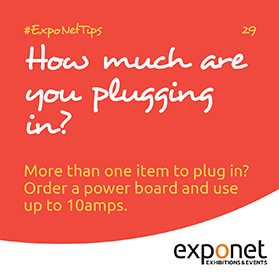 Order a power board and use up to 10amps. Consider your equipments power needs. 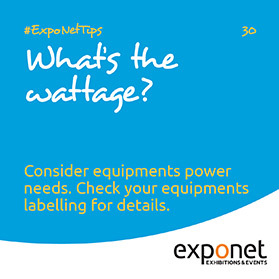 Check your equipments labelling for details. LED lights are white and bright. 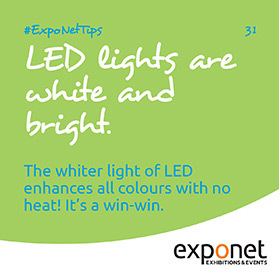 The whiter light of LED enhances all colours with no heat! It's a win-win. 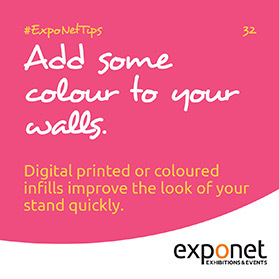 Add some colour to your walls. Digital printed or coloured infills improve the look of your stand quickly. Raised flooring offers a solid foundation. 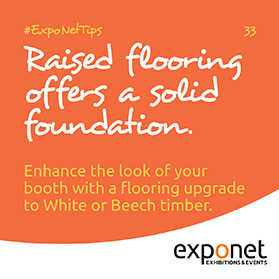 Enhance the look of your booth with a flooring upgrade to White or Beech timber. Save floor space, use wall space. 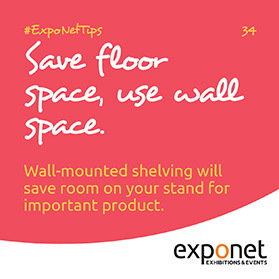 Wall-mounted shelving will save room on your stand for important product. Packages solve last minute stresses. Running low on time? Consider a Furniture Package that is ready to go! Our furniture is your blank canvas. 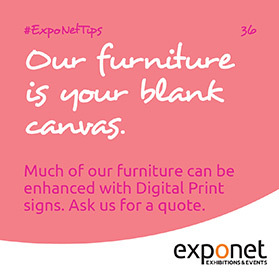 Much of our furniture can be enhanced with Digital Print signs. Ask us for a quote. Running low on time? 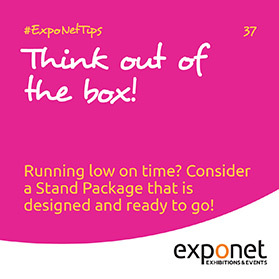 Consider a Stand Package that is designed and ready to go!